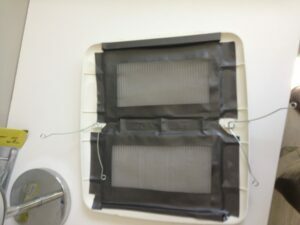 Screen vents to control scorpions, and other pests! Vents entering your home from the outside often provide entrance for scorpions and other pests. Scorpions and other pests have no trouble at all climbing stucco walls, and vents. Scorpions are one of the biggest culprits entering homes through vents in the Phoenix Valley, but other pests also enter through exterior vents like: Bees, wasps, rats, flies, mosquitoes, etc. It’s one of the easiest things you can do for scorpion control around your home. 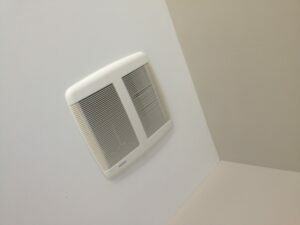 Screening vents can easily be done by homeowners, or we’ll do the dirty work for you for a small fee of $20 per vent. Step 1. Identify vents in your home that have an exterior entrance. Step 3. Cut screening material to fit. Step 4. 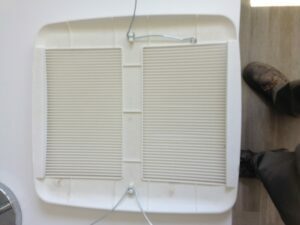 Secure screen material on the interior of vent cover. Duct tape was used here. Step 5. Replace Vent cover! Make sure vent cover fits tightly. Good Morning Diane! We do provide vent screening services to our regular scorpion & pest control customers! The charge is $20 per vent. I have a major scorpion problem, as most of us do in AZ. I was wondering if you, as a company do the actual screening of the vents. Of so, what do you charge? Hi Sandra! Scorpions are mostly a problem with vents that enter the home from the exterior. They may enter an HVAC vent, but do not get into the house that way. 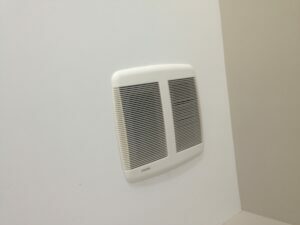 I am curious about screening AC vents. Seems I have scorpions in bedroom under that could have fallen down from vent space. I heard that scorpions can get inside walls and other structure to end up in such areas. But you would think air pushing out would not be their favorite place. 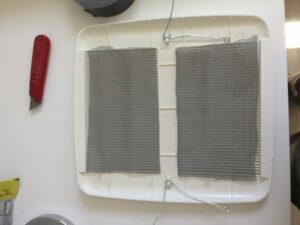 Great DIY vent screening directions… Thanks! Hope this helps keep scorpions out!